"GUIDING A CHILD INTO THE WORLD OF VALUES"
The contemporary world is full of contradictory signals and cues. Not only children but also we adults often get lost in temptation and pressure we yield to over and over again to the detriment of our health, interests or future. Moral values serve as the compass to navigate as safely as possible through life, avoiding hidden reefs and traps. The “Guiding a Child into the World of Values” book says why values are so important and how to make children eager to practice them. Successive chapters are dedicated to particular universal values such as respect, sense of responsibility, courage, self-discipline or wisdom and contain suggested topics for discussion as well as example exercises to help children understand the essence of each value, consider carefully the consequences of living by it or renouncing it, learn ways to practice it. Values help us live better lives. Teaching values to children is the most important task for us adults as values are the most significant assets we should endow children with. We truly hope this book will provide assistance in accomplishing the task. This excellent guidebook for parents does not only remind us on how important values are and how easily you can get lost without them, but also shows how to make values alive, practiced and give us a strong foundation to develop and live by them. We have many times wondered, especially lately, why so many young people resort to violence, behave crudely, vandalise public property, treat parents and the elderly with disdain or even coarsely. We are considering introducing tighter discipline in schools. The ‘zero tolerance’ project must be preceded by implementing a curriculum consisting in teaching children, the youngest of them, the standards of conduct founded on such values which must be treated in a civilised society with the requisite respect. Irena Koźmińska and Elżbieta Olszewska deserve credit for this book which is an essential primer on how to treat children. If a child cannot learn respect for other people, integrity, responsibility, courage, temperance and justice during the first years of life and gathering experiences, they will not be able to produce values-based behaviour later in their life as adolescents and adults. A child must get to know what love, friendship, happiness as well as beauty and humour are at a very early age. These are values that are indispensable in life just the same. This book is also a testimony given by the Authoresses. I was lucky to be able to work with them as the Ombudsmann. I found their approach to human rights issues and giving a child a chance in the very beginning most appropriate. I highly recommend this wise book to every parent and grandparent. An excellent book written by authoresses who are not only intellectually but also heartily committed to popularising the idea of ‘healthy development’ and creating a child-friendly environment. Many parents and teachers bring up children successfully and guide them properly towards knowledge, world-exploration undertaken on their own and various skills that are more or less likely to prove useful later in life. These good parents and teachers have nagging doubts and face difficult questions that sometimes become dilemmas. The most fundamental dilemma concerns the child image and the child-rearing concept as well as the philosophy of upbringing and education that we all adults carry in our heads and some of us also in our hearts. The basic questions can be formulated as follows: Is what I am doing and what I am not doing good for my child? How far should I interfere? What is freedom and how much freedom should I give to my child? But still the most important question is, WHY I am doing what I am doing, which means, it boils down to VALUES, to whatever makes me, as a mother or father or teacher, behave one way or another and provides a basis for evaluating my actions as good or bad for my child or pupil, now and in the future. Respect for children, who are considered to be exceptional and unique from the moment they are born, who follow their own paths of development at their own pace towards goals they have set for themselves, shines through every page of this book. But children do not walk alone surrounded by fog. There are adults beside them who have respect for a child’s autonomy and give them a sense of security which is essential to be able to explore the world on your own, who stay close whenever necessary and who withdraw in the hour of trial for a child, who accompany children in growing up and enjoy seeing the world through their eyes. Adults do not stand alone, as they have VALUES – values that are important to them, that make their behaviours toward children and all other people clear and transparent, that make a child see them as coherent, ‘well-assembled’, understandable and predictable persons. In today’s world these values serve no more as clearly visible orientation points the way lighthouses used to be for sailors, but they are more like fireflies, little bright spots preventing from getting lost but without the intention to force everyone to follow the same path to reach the same goal. There are many goals and many ways to achieve them. This book sensitises us to this and shows us what a child needs, what every human being needs to be able to walk through life by taking sometimes an easier path and sometimes a more difficult path, but always with hope to get to the goal they find vital. This is an important book for wise and sensitive adults who often feel lost in the contemporary world. It provides them with advice but first of all with support, reassurance and hope that values-based actions and child-adult relations contribute to the process of growing up and help the child evolve into a happy adult who is world-curious but enjoys closeness with people and is capable of giving this closeness to others. ‘Morality is the art of commanding our thoughts’, wrote French philosopher and moralist René Le Senne. Moral skills are among those various skills a human being has always found indispensable as they are part of our human nature. The contemporary generation needs them in particular as it is not ready to responsibly take advantage of the growing availability of newer and newer technologies offered by today’s civilisation such as computers, Internet, mobile phones or language skills. It does not cope emotionally with totally new life situations the contemporary world development brings about, either. This is why we should be thankful to Elżbieta Olszewska and Irena Koźmińska who dusted off in their book [“Your Child Needs Values”] such values and virtues as honour, self-discipline, solidarity and wisdom which have been disappearing from our public life. We cannot let these values be completely forgotten, so it is necessary to teach virtues to our children as part of their upbringing just the same our ancestors did. Values cannot be taught theoretically, but only by giving a personal testimony and by guiding children into life by means of practical experiences, as virtue is a value acquired through practice. 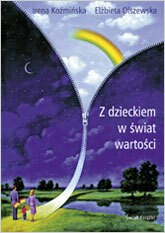 The practical nature of the book by Elżbieta Olszewska and Irena Koźmińska is its strength. The authoresses refer to specific experiences and suggest to put on a number of situations as well as reflect on them theoretically, they assist parents and teachers with guiding children conscientiously into the world of moral and emotional sensitivity and with teaching them how to make good decisions. Acquiring other technical skills without being taught virtues may simply become dangerous. The recent tragic occurrences in Polish schools have proven all too well how the Internet or mobile phones can be misused. I hope this very interesting book [“Your Child Needs Values”] that refers to the old tradition of thinking as a spiritual exercise, will help restore the basic dimension of the sphere of upbringing which consists in the practical teaching of virtues.